Stayed Dec 12 The villa was wonderful, maintained very much, very friendly staff. We were impressed with the service very much. The beach segment was also kept clean. It was always quiet and almost never see people. The situation was optimum for us, not far away from chaweng and also not far away to fisherman village. By motorbike everything was not far and quick reaching. We would come again immediately. Stayed Dec 15 We had the most spectacular week at your villa and have waxed lyrically about it to all our friends in Bangkok and back in London. We will certainly be recommending it. Your restaurant recommendations were all excellent. Thank you so much for enabling us to have a truly brilliant holiday over Christmas in Samui. Stayed Dec 14 We had a fantastic holiday and I am more than happy for you to quote any of this on your website. The villa was in a great location and was spotless. Your staff couldn't do enough for us and made our stay very relaxing. It's in great driving distances from the longer beaches. I would definitely recommend staying in the villas for a great family holiday. Stayed Jan 14 We stayed in family 1 month in this fabulous villa with our 2 children, 1 year and 4 years. The framework, the villa, the staff, the beach, are widely has the height of photos. The small restaurants, the small shopping, the seven eleven, the family market are just has 5 and 10 minutes walk. Rent a scooter or car are made available by the service reception. If paradise exists: it is here to be redone. Stayed Dec 13 Beautiful exceptional home very clean, great welcome, staff friendly , the house is very nice and very clean, the household is done all days, quiet enough, however, it must be rent a car to move, is 10 min from fisherman village with all the restaurants and 15 min from Chaweng . Truly a house to rent!!! Secure payment without any problem. Stayed Nov 13 Stunning, luxury villa on a beautiful friendly island. The service we had on arrival to Koh Sumui was second to none. The villa was absolutely beautiful. It had a wonderful calmness about it and I felt instantly at home. The location was perfect. Very close to the Big Buddha and Fisherman's Village. The food was good in all the restaurants, especially the small family run ones. Stayed Jul / Aug 13 The stay in the villa was very nice. The location and the villa are great and the management with Nid extraordinary. She was always very helpful and always has good advice to us. She's friendly art we have very much appreciated. It was for us an unforgettable, beautiful stay in Koh Samui and in the villa. Stayed Jun 13 We stayed at this beautiful villa no 1 which is conveniently located with easy access to fisherman s village at Bophut with a variety of restaurants and shops. The villa is well kitted out with all the amenities and the staff are prompt and attentive to your needs! The view from the villa is lovely with the sea sand and skies and we did are runs on the beach everyday which was great! Fully recommend it for families and couples. Just need to be careful if you have a toddler as the pool is deep and not suitable for toddlers! We will definitely visit again! Stayed Dec 11 We had a great time, the villa was very nice and comfortable for my entire family. We would recommend it in a second! From the moment we arrived at the Koh Samui's unique airport we felt relaxed and excited about our holiday. The Villa was beautiful and very well equipped. It was set in an awesome location right on the beach where the kids enjoyed collecting shells and watching the coconuts being harvested. We enjoyed the tranquility of the villa and the fact that we were only 5 minutes from a lovely beach were you could shop, swim, sunbathe, take a ride on a bananaboat etc...Everyone was extremely friendly and attentive. We will definitely return! Stayed Mar 09 We have just spent two wonderful weeks. In rare occasions your expectations for vacation exceeds when it comes to place were you going to spend your holiday, this was one of those times. What a marvellous, fantastic place, fully equipped and everything working perfectly, there was nothing we could complain about. Carlo visited us every day to ask if there was something we needed, and if there was, he fixed it right a way, from scooters to grill coal. Information provided in folder inside the house was very usefull to us. Thank you for making our holiday perfect. 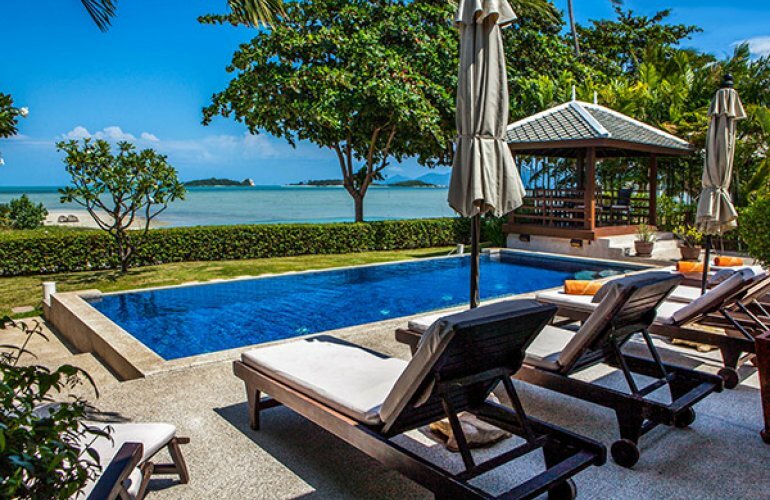 This beautiful villa blends traditional Thai design with the comforts of contemporary living. Step outside and enjoy a beachfront location with shady coconut palms, sandy beach and breathtaking sea views to nearby tropical islands. Uniquely Thai in layout, the two pavilions of the property separate the living areas from the main bedrooms and all on one level. The first pavilion contains an open-plan living area, decorated in a contemporary theme, with Thai ornaments and wall hangings blending in harmony with the modern furnishings. Sliding glass doors can expose your living space to the sea breezes, and offer excellent multi-sided views. The formal dining area has seating for six, and the fully equipped kitchen provides all the modern conveniences without marring the traditional surroundings. This pavilion also contains a spacious bedroom, with a queen-size double and en-suite facilities. The tropical climate of Koh Samui is ideal for alfresco dining, and the outdoor deck area provides ample space and comfortable furniture to do just that as you look out over the sea, or relaxing in the sala with a glass of chilled white wine. The private swimming pool is surrounded by a spacious sunbathing terrace with ample cushioned sun loungers and parasols. It has its own washroom and shower. During certain times of the year, the sea recedes over 200 meters, at all times the water is shallow and not suitable for swimming. It's a short drive to Choeng Mon, one of the best swimming beaches on the island.